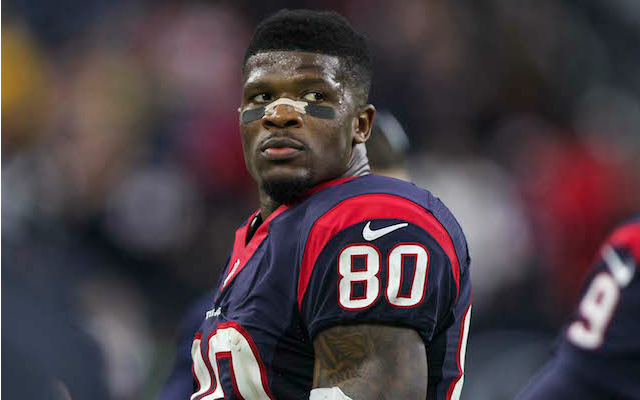 Home » Unlabelled » Johnson says "Goodbye Houston"
After serving as the face of the Houston Texans through much of his 12 seasons with the franchise, Andre Johnson is prepared to start over with a new team. Johnson's agent has been permitted to seek a trade, and the wide receiver will be waived if one cannot be found, the Houston Chronicle reported Monday. The Texans earlier informed the 33-year-old wide receiver that he would have a reduced role next season, Johnson told the Chronicle. "If we were living in a perfect world, you know I'd want to finish my career here, but, unfortunately, that's not what's going to happen," Johnson said. "You just have to move forward." Kennard McGuire, Johnson's agent, told ESPN that the seven-time Pro Bowl selection is ready to part ways with the Texans. "Time has come," McGuire said. "It has been a great run, but as you know in the sports world, there is a shelf life. He looks forward to challenging for a Super Bowl." Johnson posted a message to his Instagram page on Monday night thanking fans for their support. After hauling in 221 catches for 3,005 yards over the previous two years, Johnson recorded 85 catches for 936 yards with the Texans in 2014. The prospect of a reduced role did not sit well with him. "I don't know how you tell a guy who catches 85 balls that he'll only probably catch 40," Johnson told the Chronicle. "I feel like the role they were trying to put me in I'd be held back from maximizing my talents. I feel like that was the best thing for both sides. "Why sit there and be miserable when I can go somewhere else and be able to show my talents." Johnson has the second-most career receptions (1,012) and receiving yards (13,597) of any active player, trailing only Reggie Wayne of the Indianapolis Colts. After being selected third overall in 2003, the franchise's second year of existence, Johnson had to wait until the 2011 season to play in the postseason. The Texans have made the playoffs just twice in his 12 years with the team. Johnson has two years remaining on his contract. "I was just made aware of this whole situation today," Johnson said. "I haven't really had time to really find out anything else. "My biggest thing right now is just trying to get everything finalized with the Texans and then move forward."